For more than fifty years scientists have been concerned with the interrelationships of Earth and life. Over the past decade, however, geobiology, the name given to this interdisciplinary endeavour, has emerged as an exciting and rapidly expanding field, fuelled by advances in molecular phylogeny, a new microbial ecology made possible by the molecular revolution, increasingly sophisticated new techniques for imaging and determining chemical compositions of solids on nanometer scales, the development of non-traditional stable isotope analyses, Earth systems science and Earth system history, and accelerating exploration of other planets within and beyond our solar system. Geobiology has many faces: there is the microbial weathering of minerals, bacterial and skeletal biomineralization, the roles of autotrophic and heterotrophic metabolisms in elemental cycling, the redox history in the oceans and its relationship to evolution and the origin of life itself.. This book is the first to set out a coherent set of principles that underpin geobiology, and will act as a foundational text that will speed the dissemination of those principles. The chapters have been carefully chosen to provide intellectually rich but concise summaries of key topics, and each has been written by one or more of the leading scientists in that field.. Fundamentals of Geobiology is aimed at advanced undergraduates and graduates in the Earth and biological sciences, and to the growing number of scientists worldwide who have an interest in this burgeoning new discipline. 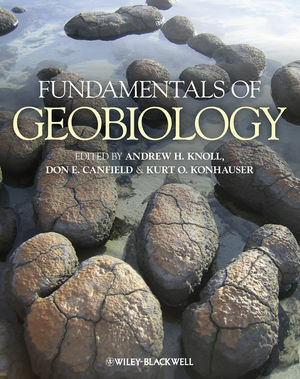 Additional resources for this book can be found at: http://www.wiley.com/go/knoll/geobiology. Andrew H. Knoll is the Fisher Professor of Natural History at Harvard University. A paleontologist by training, he has worked for three decades to understand the environmental history of Earth and, more recently, Mars. Knoll is a member of the U.S. National Academy of Sciences. Donald E. Canfield is Professor of Ecology at the University of Southern Denmark and Director of the Nordic Center for Earth Evolution (NordCEE). Canfield uses the study of modern microbes and microbial ecosystems to understand the evolution of Earth surface chemistry and biology through time. Canfield is a member of the U.S. National Academy of Sciences. Kurt O. Konhauser is a Professor of Geomicrobiology at the University of Alberta. He is Editor-in-Chief for the journal, Geobiology, and author of the textbook, Introduction to Geomicrobiology. His research focuses on metal-mineral-microbe interactions in both modern and ancient environments. PROSE Awards 2012: Honorable Mention in the Earth Sciences Category.